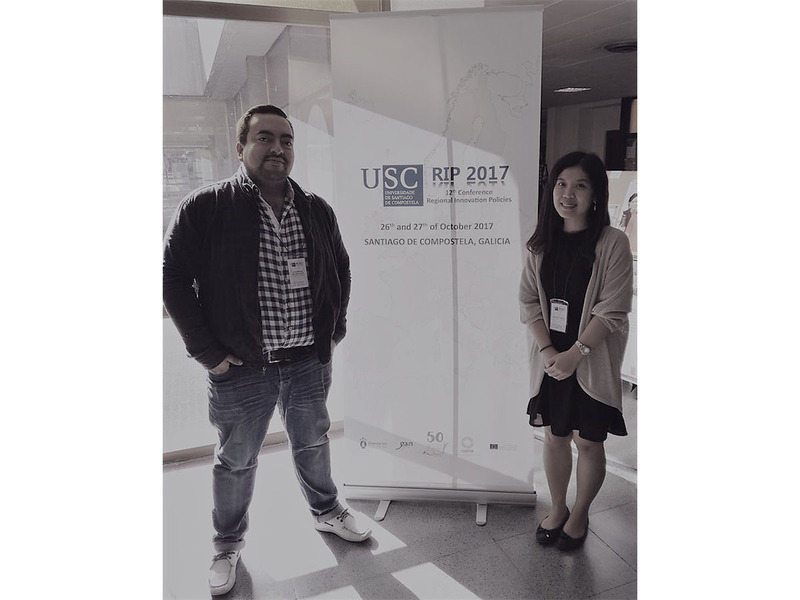 For RUNIN members, all roads led to Santiago de Compostela for the RIP Conference slated for 26th – 27th October 2017. 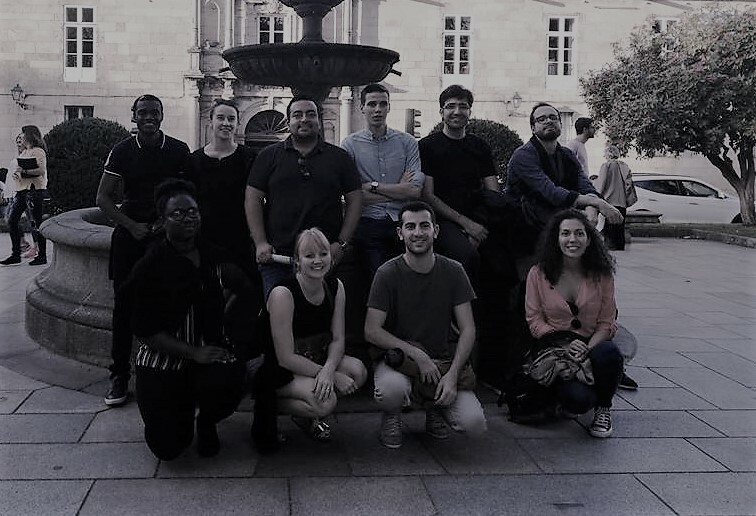 Accordingly, 13 RUNIN Early Stage Researchers, joined by five senior staff from the project, presented their work at the conference. The second and last day of the conference focused on the role of universities in regional development. 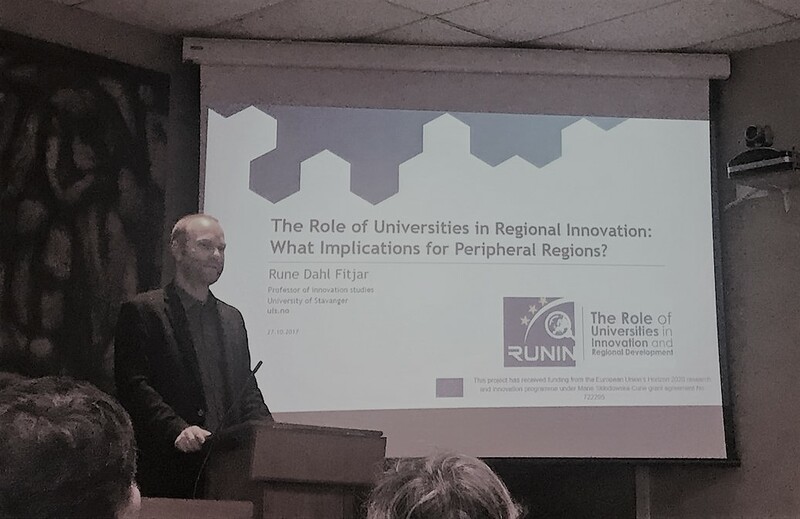 The RUNIN project leader, Professor Rune Dahl Fitjar of the University of Stavanger opened the day with a keynote speech on ‘The Role of Universities in Regional Innovation: What Implications for Peripheral Regions?’, which was met with keen attention and interest by the audience. 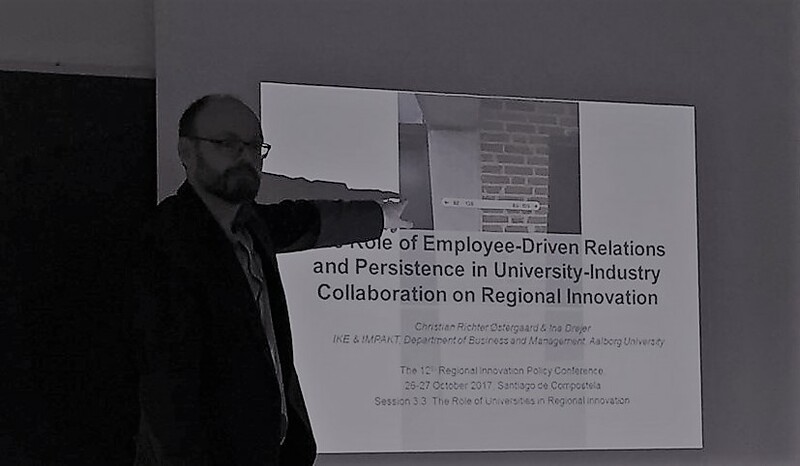 Rune Dahl Fitjar’s keynote was followed by two RUNIN special sessions in the parallel tracks, thus making it appropriate to describe this day as hit by a ‘RUNIN’ invasion! The RUNIN sessions were unique for having a ‘discussant’ for each presentation. This implied that in addition to the general audience, senior academics, who had read the papers in advance, were present to provide feedback. 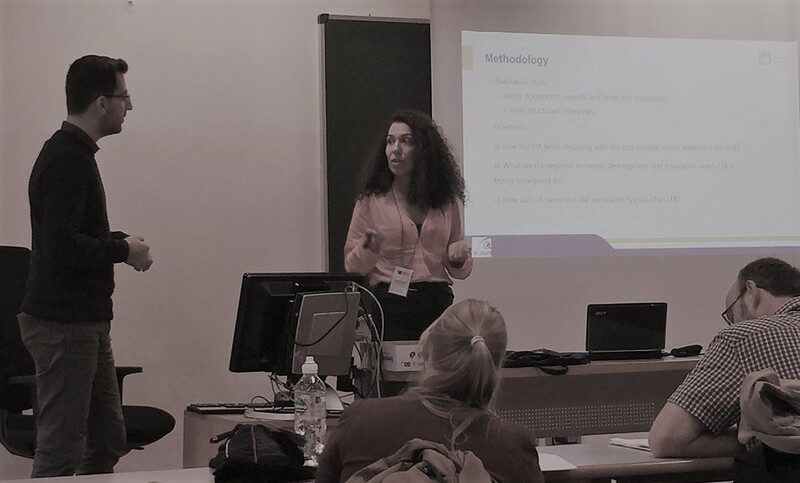 In the first RUNIN special session, Sofya Kopelyan and Lisa Nieth set the ball rolling by sharing insights on the ‘regional mission’ possibilities or impossibilities in the light of existing tensions between the University of Twente and the Twente Region. A favourite identified challenge from this presentation was, to quote an interviewee, ‘what is the telephone number of the university?’. This example highlighted certain minor and easy to overlook areas, which could yet mitigate university-regional engagement. This presentation was followed by reflections on overcoming the ‘barriers to regional engagement’ from the University of Lincoln, UK. 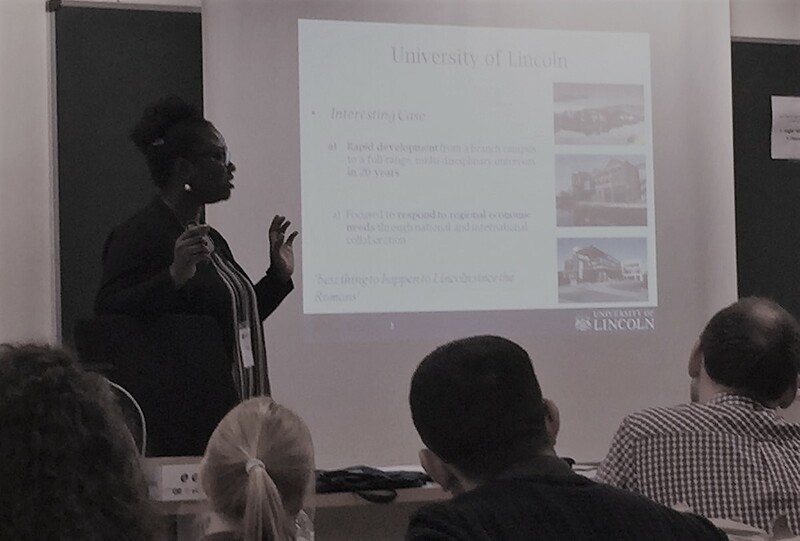 Rhoda Ahoba-Sam, Maria Salomaa, and David Charles emphasised that ‘though the university was the best thing to happen to Lincoln since the Romans’, a concerted effort from all stakeholders was required to overcome the identified barriers. This session closed with a presentation from the Autonomous University of Barcelona by Sergio Andrés Manrique Garzón and Huong Nguyen on ‘Balancing regional engagement and internationalisation’ – a study which was so intriguing that Barcelona-native David Fernández Guerrero of Aalborg university got shown the ‘1-minute, your-time-is-up’ sign by the chairman of the session for asking a very long question! 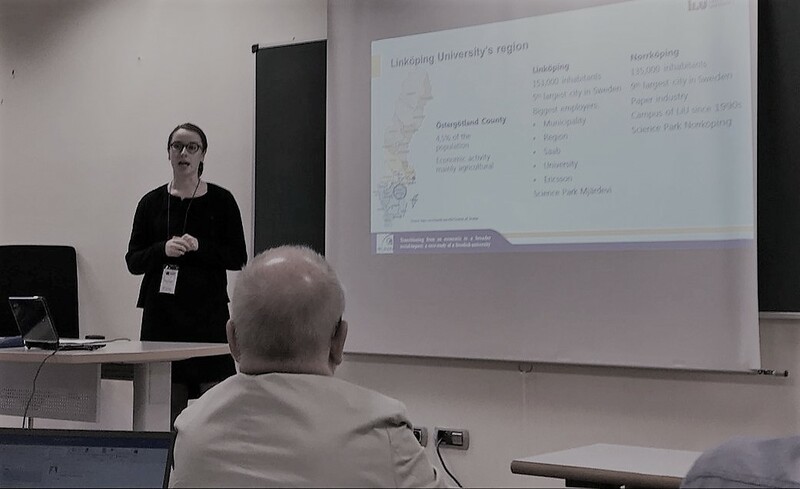 The second RUNIN special session, opened with a presentation by Eloïse Germain-Alamartine on the history of Linköping University’s engagement with the Östergötland County in Southern Sweden, where she challenged existing models of universities’ regional roles. The discussion was peppered with a big ‘so what’ question on the implications of these findings for policymakers. Next, we re-located to North Denmark with Gerwin Evers and David Fernández Guerrero. 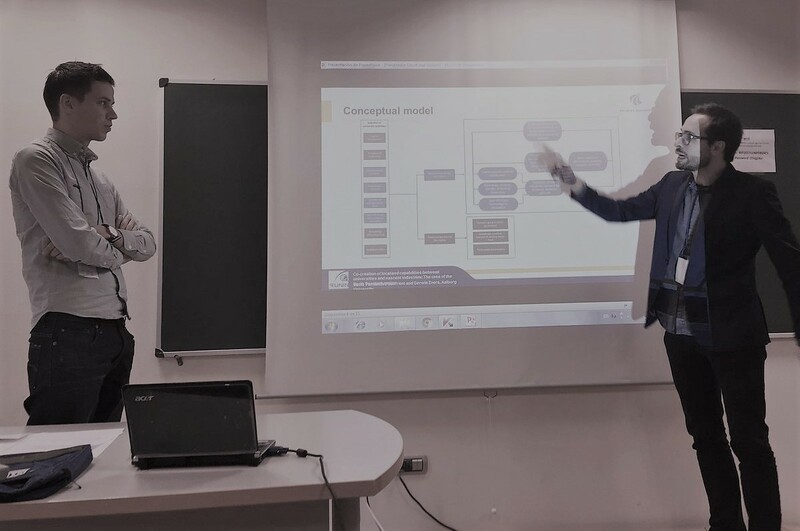 Looking at the emergence of ICT and biomedical industries in the region, Gerwin and David addressed factors that conditioned successful co-creation of knowledge between Aalborg University and local science-based firms. They proposed that, among other things, gaining ‘critical mass’ by businesses was critical for enabling the university to genuinely support them. Attendees of the session were keen to divorce this story from its Scandinavian context and test whether it would fit their own regions. 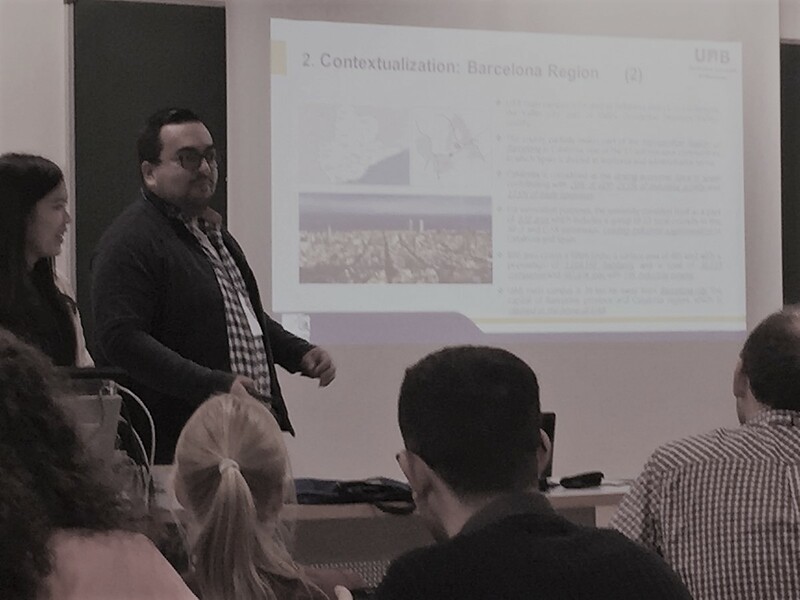 Lastly, Utku Ali Rıza Alpaydın, Kwadwo Atta-Owusu, and Saeed Moghadam Saman turned the tables and spoke on the role of regions in university innovation. 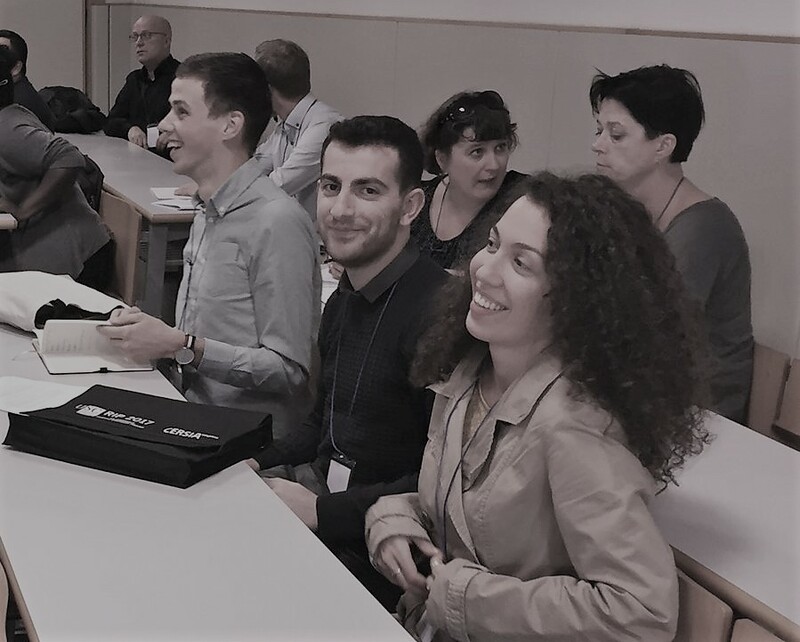 Saeed made us companions in a dramatic evolution of Stavanger University, which, nested in the Rogaland Region in Western Norway, had been highly dependent on the ups and downs of the oil industry. This time, policy recommendations were aimed at university leaders. 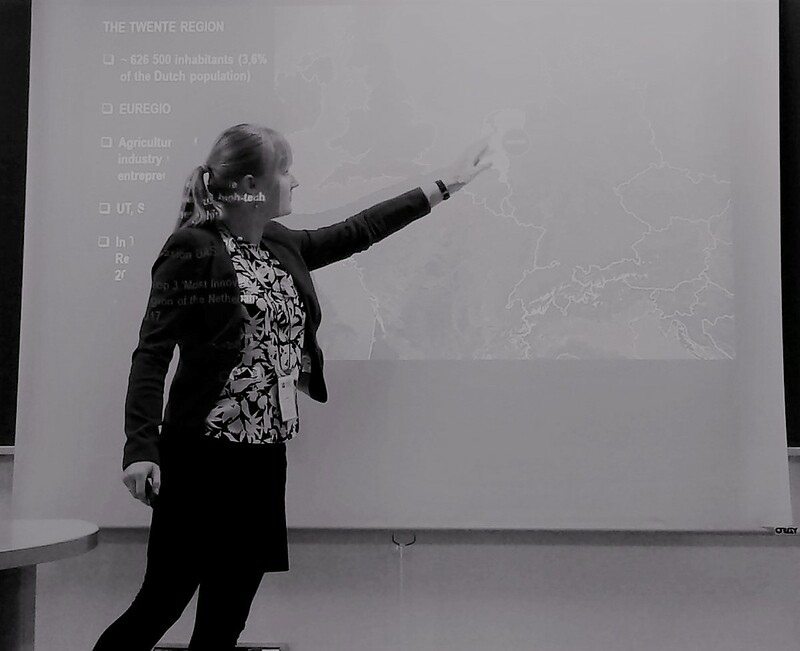 Having analysed urgent demands in core sectors, the team researched how Stavanger University was transforming itself to become a major aid in transforming regional energetics and healthcare. With three presentations on Scandinavian regions, this final RUNIN session had a pronounced Nordic flavour. 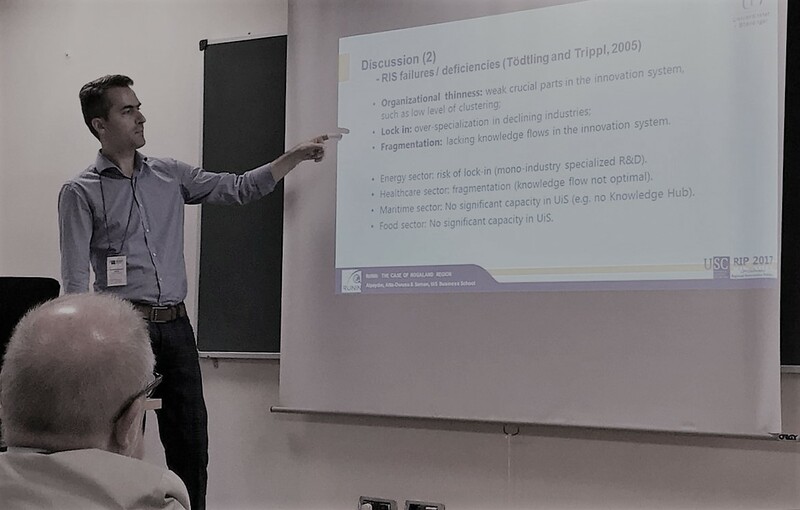 Yet, it hit a common nerve among conference participants who shared concerns, hopes, and valuable ideas about innovation at less established universities and less developed regions.